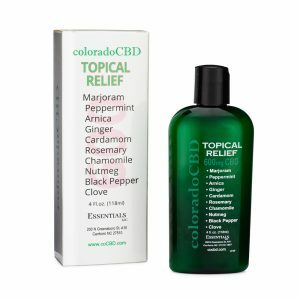 NEW TRIPLE STRENGTH – 300 milligrams of CBD (150 milligrams of CBD per ounce) wrapped around a cluster of healing essential oils in a super-charged moisturizing and nourishing emulsion. An ultra-dense, non-staining lotion with high levels of Vitamin E and natural fatty acids as well as extracts of Chamomile, Lavender, Sweet Melissa and Honey, which soothe, soften and hydrate the skin. Free-radical scavenger properties also help reduce the harsh effects of time and environmental stress on the skin. 2-ounce easy-travel bottle. Marjoram, (Sweet) favored for muscle spasms, sprains, and tired or stiff muscles, with excellent warming, soothing and antispasmodic properties, it is used to ease joint pain and muscle spasms. Peppermint is used on aching muscles to relieve pain and improve blood circulation to the area, reducing the inflammation that causes the pain. Also, known as antimicrobial, anti-inflammatory, and fungicidal. Arnica oil relieves pain, inflammation and bruising, sprains, soreness and swelling and for the relief of arthritis, muscle, and joint pain. Ginger spice fights cramps, soothes sore muscles, and calms cranky winter skin. Studies have shown ginger eases muscle pain caused by exercise-induced muscle injury. Ginger’s warming essential oil improves circulation and blood flow, relieving tired muscles. Cardamom’s main properties for skin are antioxidant, antiseptic, cleansing. Cardamom oil is one of the oldest essential oil known. Egyptians used it in perfumes and incense. The warming properties found in the spice also make the essential oil useful in massage oil formulas. Rosemary applied topically, is a popular treatment for muscle pain and arthritis. It also used to help circulation, reduce itching and irritation and reduce dry, itchy patches of skin caused by psoriasis, eczema, and dermatitis. Chamomile is another of Nature’s miracles, it is used as an anti-inflammatory, anti-fungal, antibacterial, antiseptic, and contains essential oils and antioxidants. Additionally, as a hypoallergenic it is believed to help reduce skin irritants by neutralizing free radicals. Nutmeg essential oil is used to help relieve muscle pain, swelling, inflammation, and even promote circulation. It can be applied directly on the inflamed muscles to relax the given joint or tendon. Also has strong antibacterial properties. Black pepper oil has warming, anti-inflammatory properties. It can be used to reduce pain due to muscle injuries and tendonitis. It is often used to reduce pain due to muscle injuries and tendonitis. Clove Bud Oil is popular for its antimicrobial, antifungal, antiseptic, antiviral, aphrodisiac and stimulant properties. No other essential oil is found to have such high antioxidant properties. Safflower Seed Oil is used as a lubricant with occlusive properties, meaning that it acts as a protective barrier to prevent water from leaving your skin. 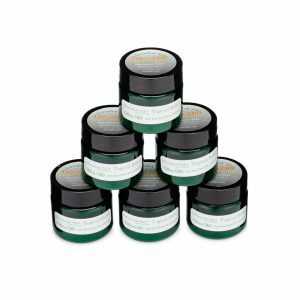 It works with your skin to soften dryness, smooth roughness and soothe some skin problems. Tocopheryl Acetate is a form of Vitamin E, a natural skin-conditioning agent and antioxidant. An anti-oxidant, anti-aging agent, moisturizer, anti-inflammatory aid with enhanced SPF properties, Tocopheryl Acetate is believed to promote the healing process. Glyceryl Stearate SE (self-emulsifying) is a lipid used as surfactant and emulsifying agent. Lavender flower extract. Perhaps the most beloved of all essential oils, made from the flowers of the Lavender plan, it is used as an antiseptic, anti-inflammatory, cleansing, balancing, and soothing agent and as an aid in the healing of wounds, burns, sunburns. Lemon Balm: A Super-Herb for the skin has been used for thousands of years for all sorts of ailments, calming, soothing, healing and tightening on the skin, also stimulating circulation. Strong anti-inflammatory and antibacterial properties. Tocopheryl acetate is a form of Vitamin E, a natural skin-conditioning agent and antioxidant. Zea Mays (Corn) oil is moisturizing with a mild scent. It has been used successfully for many years in treating dry skin. Retinyl palmitate is the ester of retinol (vitamin A) combined with palmitic acid, a major component of palm oil. Vitamin A is one of the most important vitamins for the appearance of the skin because its tiny molecules have the ability to penetrate the outer layers of the skin and work to repair the lower layers where collagen and elastin reside. It helps activate the natural regeneration of dermal tissue and improve its elasticity reducing the appearance of fine lines and wrinkles. Cholecalciferol, also known as vitamin D₃ is found in food and used as a dietary supplement for mild ​skin rash or redness, nausea and mild to moderate pain in bones, muscles, or joints. Polysorbate 80 is primarily used in cosmetics and beauty products as a surfactant and emulsifier because of its ability to help other ingredients dissolve in a solvent in which they normally would not be able to dissolve, specifically in the case of oil in water. Cetyl Alcohol is an emollient, emulsifier, thickener and carrying agent for other ingredients contained in a cosmetic solution. It keeps the oil and water parts of an emulsion from separating, and gives products good spreadability. Triethanolamine a pH balancer is used as a buffering agent, surfactant, masking and fragrance ingredient. Tetrasodium Glutamate Diacetate made from plant material, readily biodegradable, with high solubility over a wide pH range, is a multi-purpose, clear, liquid chelating agent and preservative booster. Sorbitan Oleate is an oil-in-water emulsifier particularly suited to formulations that contain vegetable oils. Ethylhexylglycerin is made using glycerin. Both colorless and odorless, it is one of the most common ingredients in skincare products. It helps keep the various natural ingredients in beauty products from spoiling. Chelating agent- increases effectiveness and improves stability, boosts preservative activity, inhibits fragrance and color degradation. Emollient – an adjective used to describe something with a softening or soothing effect. Emulsion – a mixture of two or more liquids that are normally unmixable or unblendable. Emulsifier – a compound or substance acting as a stabilizer for emulsions, preventing the liquids from separating. Ester – an organic compound made by replacing the hydrogen of an acid. Many essential oils are esters of fatty acids. Lipid – fatty acids or their derivatives that are insoluble in water but soluble in organic solvents. They include many natural oils, waxes, and steroids.